The curriculum is challenging as well as engaging while meeting and exceeding the Ohio Standards. The Middle School language curriculum includes reading, discussion, and background information on all types of fiction, non-fiction and poetry, all with the goal of helping students develop stronger skills in interpreting literature. Students work individually and in small groups to develop skills in writing explanatory, narrative, and persuasive pieces. These skills include adding a sufficient amount of details to whatever writing is being done; using effective vocabulary or figurative language; and, of course, proofreading for grammar, spelling, punctuation, etc. The study of vocabulary, spelling, punctuation, and grammar all continue from work begun in the elementary program. As part of their work in any area, students work frequently to prepare, organize, and deliver oral presentations. 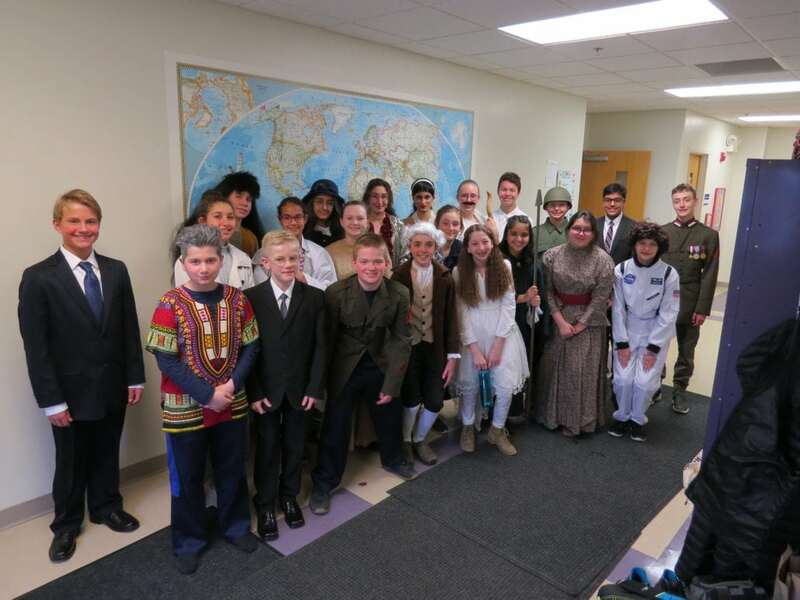 The three-year Middle School curriculum continues the study of civilizations begun in the elementary program and also includes an in-depth study of American History, from the earliest civilizations (Aztec, Inca, and Maya) through the twenty-first century. In addition, the history curriculum includes a study of how America’s government began and evolved to its current form, as well as a study of current events and issues. The study of geography extends from identifying and locating countries, cities, and physical features (mountain ranges, deserts, rivers, and other bodies of water) to studying the impact geographical features of a country or region have on the region’s natural resources, trade and economy. The science curriculum includes studies in Astronomy, Earth Science (Geology and Meteorology), Physical Science (motion and forces; energy), Biology, and Chemistry. In each area, presentations and lessons are integrated with lab procedures designed to reinforce or teach particular concepts. Middle School classwork and homework combine both short-term assignments and longer, project-like work with due dates further into the future. For students to be successful at either of these, they need to plan and manage their time well, take careful notes on what is taught in a lesson and in what they read, and review materials thoroughly for review assignments such as quizzes and tests. Students are given guidance in all these areas. In addition, part of the Middle School daily routine is recording work assignments in a planner, then using the planner to guide one’s choice of what assignments should be done before others, how homework time should be organized, and so on. Middle School students promise to participate in thirty-six hours of community service during the school year. Service hours can be completed in a variety of settings, serving the family, the school, and the broader community. Most students experience a variety of types of activities through the school year. Students should expect to receive no financial compensation for Community Service time; service is to be completed for the benefit of others, rather than the benefit of oneself. Our eighth grade students take an annual trip during the school year. Previous trips have included a study of government and history in Washington, DC; a marine biology focus in Pigeon Key, FL; and participating in a United Nations program for Montessori students in New York City. Elementary and Middle School students participate in two standardized tests each year: The CogAT in the fall, which is a predictive test, giving us insight as to each student’s areas of strength, weakness and learning styles; The IOWA in the spring, which measures our students’ achievement based upon a national curriculum. Although we teach a Montessori curriculum, not a national curriculum—which has very different benchmarks than our own—on average, our students score significantly above national averages. In addition, we implement a test-teach-test system for our math, geometry and language curriculum throughout our Elementary and Middle School which ensures that each student is exposed to and learns each component of the curriculum at a minimum of 80% proficiency.